Before you ask, this is not a general-purpose DOS emulator for the DS. 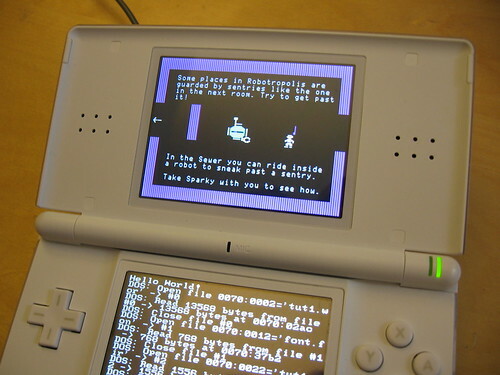 It’s actually a static binary translator which does most of the work in porting a DOS game to the DS, but there’s still an awful lot of manual intervention required. I only really developed the translator with Robot Odyssey in mind, so there are sure to be features missing that you’d need in order to use it with other games. 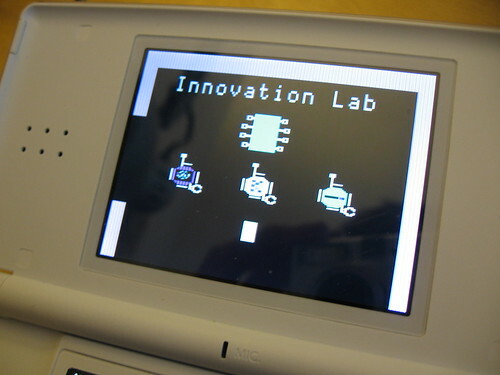 My intent is to turn this into a real port of Robot Odyssey to the DS, not just an emulation. In particular, I’d like to re-do the load/save game UI to support timestamps and thumbnails, and I’d like a soldering mode that makes use of the DS’s touchscreen. This entry was posted in Portfolio, Robot Odyssey and tagged abandonware, binary translation, dos, ds, emulation, games, porting, reverse engineering on April 27, 2009 by Micah.